It’s nearing the end of the week and my brain has pretty much declared a start to the weekend. As much as I have tried to come up with something witty to say about these chocolate cookies, my words have fallen flat. I blame the intense chocolate flavor of these cookies for my lack of concentration. However, you should definitely not let my writing inabilities keep you from trying these. They are rich, chocolatey, chewy, decadent AND they happen to be gluten-free. You know what else these cookies are free of? Added butter or oil. Though I wouldn’t call these chocolate cookies low-fat, they do seem “lower-fat” than your average chocolate chip cookie. Most of the body and texture of these cookies comes from egg whites that get beaten with powdered sugar into a lovely meringue. 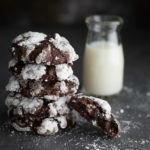 Once you stir in the melted chocolate, everything comes together into a nice, stiff dough that gets scooped out, rolled in powdered sugar, and baked. So whether you’re in need of some serious chocolate therapy or just needing a cookie break, I’ve got you covered. Heat oven to 400 degrees. Line 2 large baking sheets with parchment paper. Put 1 cup chocolate chips in a microwave safe bowl. Microwave for 1 minute on high power and then stir. If there are still chunks of unmelted chocolate, microwave the mixture again for 30 seconds and stir. Continue microwaving the mixture in short increments and stirring until all the chocolate is melted and the mixture is smooth. Cool chocolate until it is lukewarm. Set aside. In a medium bowl, whisk together 1 cup powdered sugar, cocoa powder, cornstarch, and salt. Set aside. Using an electric mixer, beat egg whites in a large bowl until soft peaks form. Gradually beat in 1 cup powdered sugar. Continue beating until the mixture is thick and glossy and resembles soft marshmallow creme. Reduce the speed to low and gradually beat dry ingredients into meringue. With a spatula, stir in melted chocolate and remaining 1/2 cup chocolate chips until mixture is evenly blended. The dough will be very stiff at this point. Place remaining 1/2 cup powdered sugar in a small bowl. Roll 1 rounded tablespoon of dough into a ball and roll it in the powdered sugar, coating thickly. Place on prepared sheet. Repeat with remaining dough, spacing cookies 2 inches apart. Bake cookies until puffed and tops crack, 10-12 minutes. Cool cookies on sheets on rack for 2-3 minutes then transfer cookies to rack to cool completely. Recipe adapted from Bon Appétit, June 2008.